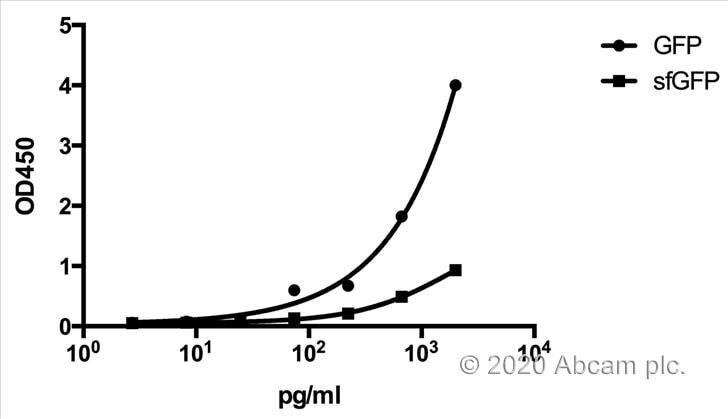 Abcam’s GFP in vitro SimpleStep ELISA® (Enzyme-Linked Immunosorbent Assay) kit is designed for the quantitative measurement of GFP protein in cell and tissue lysates. This kit will detect both the Enhanced and Superfold variants of GFP. Green fluorescent protein (GFP) is a 27 kDa protein derived from the jellyfish Aequorea victoria, which emits green light (emission peak at a wavelength of 509 nm) when excited by blue light (excitation peak at a wavelength of 395 nm). GFP has become an invaluable tool in cell biology research, since its intrinsic fluorescence can be visualized in living cells. GFP fluorescence is stable under fixation conditions and suitable for a variety of applications. GFP has been widely used as a reporter for gene expression, enabling researchers to visualize and localize GFP-tagged proteins within living cells without the need for chemical staining. 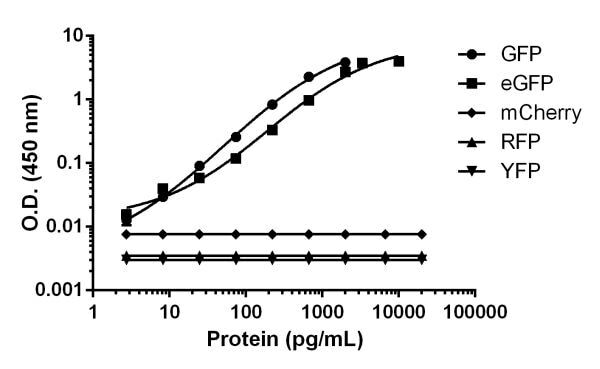 Other applications of GFP include assessment of protein protein interactions through the yeast two hybrid system and measurement of distance between proteins through fluorescence energy transfer (FRET) protocols. GFP technology has considerably contributed to a greater understanding of cellular physiology. YFP differs from GFP due to a mutation at T203Y; antibodies raised against full-length GFP should also detect YFP and other variants. Energy-transfer acceptor. Its role is to transduce the blue chemiluminescence of the protein aequorin into green fluorescent light by energy transfer. Fluoresces in vivo upon receiving energy from the Ca2+-activated photoprotein aequorin. 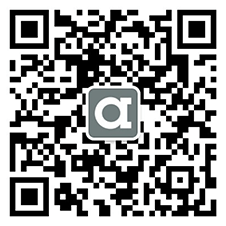 Our Abpromise guarantee covers the use of ab171581 in the following tested applications. This kit recognizes both GFP and enhanced GFP (eGFP) in cell and tissue extracts. No reactivity with mCherry, RFP or YFP was observed. Background subtracted data from triplicate measurements are plotted. The kit works with superfold GFP. I have tested again our purified superfold GFP protein and also some cell lysate from cells expressing superfold GFP. Both worked. 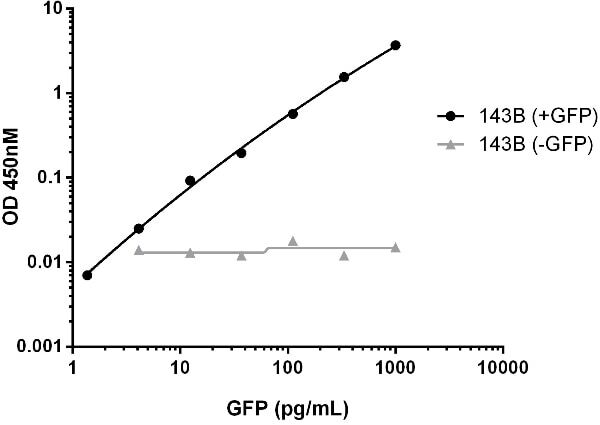 When compared with the GFP stock provided by the kit, the sensitivity against superfold GFP is lower than GFP. This could be due to our protein stock is stored at -80C for sometime.